Recently, legal aid for the detained, arrested and prosecuted criminal defendants has quite often been on the agenda of Turkey: first within the framework of the new Criminal Code and then in terms of the failure to pay the legal fees of lawyers who provide the service. This book shows the results that come out when focusing on the most relevant persons, the clients of the service. 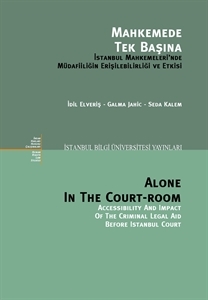 The observations made before the Istanbul criminal courts at the time when the new code went into effect, the review of case files and the data from the interviews with the judges, prosecutors and attorneys demonstrate that the access rate of the service is much less than the expected. This creates problems for Turkey in terms of the right to defense including right to free legal aid and equality of arms guaranteed by the European Convention on Human Rights. At the same time, the findings reveal that the impact of the service also contains question marks. This couid be interpreted as an indication of the problems regarding the quality of the service. Lastly, this research also constitutes an example of law and society research widely carried out all over the world. In this sense, with the aid of field data the book shows how laws operate in practice and aims to contribute to legal policy making.